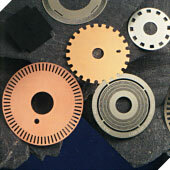 Fotofab was founded in 1967 to offer the cost and delivery advantages of photochemical machining to manufacturers of electronic and electrical equipment for high tech industries - aerospace, microwave, automotive, computers, communications, medical and controls. 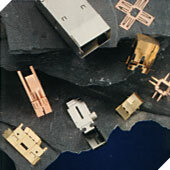 A phototool (tooling) for customers custom part can typically be produced in one or two days, allowing customers metal parts to ship in as few as three days. Design changes are easy to introduce during the process, thus hastening customer product's time to market and enhancing flexibility along the way. 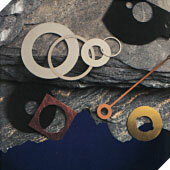 Most phototools cost in the $300 to $400 range, thousands of dollars less than hard tools to produce equivalent parts. 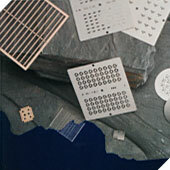 The Fotofab Process offers the flexibility to produce unusual configurations to tight tolerances (within .0005"), including the capability of producing small holes and bars that are not possible with most stamping processes. Using state-of-the-art CAD, 1/4 mil resolution is routine. 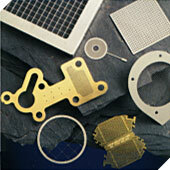 See typical applications of chemical etching. 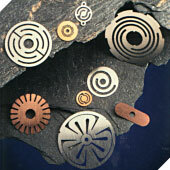 The speed and low cost of the process make it an ideal technique both for prototypes and for production quantities of precision metal parts, even into the millions. 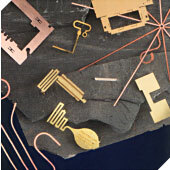 Consult our "Design Guide To Photochemical Machining" for several other design advantages inherent to the Fotofab process. 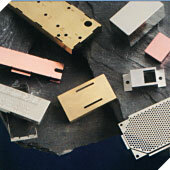 Through chemical etching and metal stampling Fotofab produces typical applications such as RF/EMI shields, screens, contacts, connector housings, lead frames, apertures and many more. 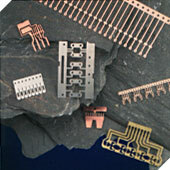 Fotofabs also offers a selection of standard RF shields and can customize RF shielding to customers specifications. Fotofab's rapid prototyping service is so efficient thay can usually deliver customers prototype within a few days of receiving customers order. Fotofab assures single source responsibility and control over the delivery and quality from the suppliers of our secondary services. 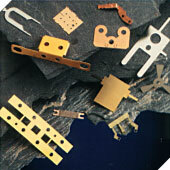 We offer standard and custom part packaging for order quantities of one and up.